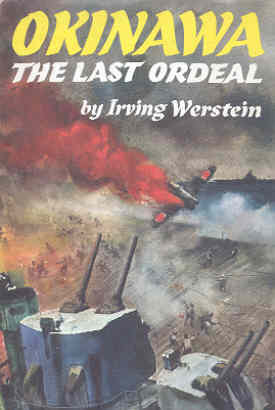 Irving Werstein, who passed away in 1971, wrote over 50 books about American history for children. His four other books on the Pacific War include ones on Midway, Guadalcanal, Wake, and Tarawa. Okinawa: The Last Ordeal presents the last major battle of WWII, fought from April to June 1945, in an easy-to-read fashion with several maps. However, the information on Japan's kamikaze attacks contains several inaccuracies, which makes one wonder whether the author tried to sensationalize certain aspects of the Special Attack Corps that carried out suicide attacks. Chapter 1 provides an error-filled background to the Kamikaze Corps organized in October 1944 by Vice Admiral Takijiro Onishi in the Philippines. The book claims that "Admiral Onishi threw 600 suicide aircraft into the fray" during the Battle of Leyte Gulf from October 23 to 26, 1944 (p. 8). Actually, this number of aircraft carried out suicide attacks over a period of three months from October 1944 to January 1945 . This beginning chapter incorrectly states that "Onishi was relegated to minor posts for the rest of the war" after Japan's defeat in the Philippines (p. 10). However, in fact one supposedly "minor post" he took included Vice Chief of the Naval General Staff to command Japan's naval operations . He was an indefatigable and dynamic organizer, far more effective than Onishi had been. Ugaki so glamorized kamikaze that it reached the status of a cult. The slipshod methods used in the Philippines were to be tolerated no longer. Both men rose to rank of Vice Admiral as effective organizers, and statistics of kamikaze attack results do not support the above statements that Ugaki was far more effective and that Onishi used "slipshod methods" in the Philippines. The percentage of successful hits or near hits by special attack aircraft decreased from 27.1% in the Philippines under Onishi to 13.4% in the Battle of Okinawa under Ugaki . Ugaki's diary also does not give any indication that he "glamorized kamikaze" but rather that he was striving to use all methods under his command, both special (suicide) attacks and conventional attacks, to stop the Americans from taking Okinawa . The author's first example of Ugaki's superior kamikaze attack methods is the attack on American ships off Iwo Jima on February 21, 1945 (pp. 10-1), but Ugaki did not even command this suicide attack since it was carried out by aircraft from the 3rd Air Fleet rather the 5th Air Fleet . Dates also get mixed up. Werstein explains that the first kamikaze (divine wind) rose up as a typhoon to destroy a Mongolian fleet invading Japan, but he mistakenly gives the year as 1570 (p. 5) rather than the actual years of 1274 and 1281. The book opens with the following quotation from instructions to pilots of the Japanese Special Attack Forces known as Kamikaze: "It is absolutely out of the question for you to return alive . . . . Choose a death which brings about the maximum result . . . ." The date for this quotation is given as August 1944, two months before Vice Admiral Onishi even formed the Kamikaze Special Attack Corps. On March 21, 1945, Vice Admiral Ugaki first used ohka rocket-powered glider bombs against the American fleet, and all of the mother planes and ohka bombs were shot down by American fighters , but Werstein gives the wrong date of March 20 for this battle action (pp. 40-1). Some inaccurate statements by the author embellish the history of Japan's Special Attack Forces. In his history of the use of kamikaze pilots during the Battle of Leyte Gulf, he describes the pilots' wearing "white silk scarves lettered with the initials of the Special Attack Force" (p. 7), but this did not happen with the pilots' volunteering for attacks only a few days earlier. He wrongly describes the aircraft used by kamikaze pilots during the Battle of Leyte Gulf, "Nor would kamikazes be assigned first-class planes—only aircraft no longer fit for usual combat flying were allowed the suicide squadrons" (p. 7). The aircraft used in the first kamikaze attacks in the Philippines were fit for combat flying, although the Japanese military much later during the Battle of Okinawa used aircraft such as trainers and seaplanes in suicide attacks. The author also states that kamikaze pilots climbed into their cockpits "often on legs made wobbly from too much sake" (p. 12), but this assertion just seems like an attempt to sensationalize their history rather than present facts. The book's 19 chapters do a passable job of telling the story of the furious land and sea battles at Okinawa that lasted from April 1 to June 21, 1945. Several chapters present the Japanese perspective of troops on land led by General Ushijima. The first half of the book covers background and events prior to the invasion of Okinawa. Although the book includes various quotes from Battle of Okinawa participants, there is no attempt to follow the actions of any one individual or unit. The author effectively mixes quotes and historical facts to make the book interesting for children. However, kamikaze attacks during the Battle of Okinawa get summarized often with little more than ship names and number of casualties of major ships hit with no attempt to capture the feelings and opinions of American and Japanese participants. 1. Ozawa 1983, 78; Yasunobu 1972, 171. Ozawa, Ikuro. 1983. Tsurai shinjitsu: kyokou no tokkou shinwa (Hard truths: Fictitious special attack myths). Tokyo: Dohsei Publishing Co.
Ugaki, Matome. 1991. Fading Victory: The Diary of Admiral Matome Ugaki, 1941-1945. Translated by Masataka Chihaya. Edited by Donald M. Goldstein and Katherine V. Dillon. Pittsburgh: University of Pittsburgh Press. Yasunobu, Takeo. 1972. Kamikaze tokkoutai (Kamikaze special attack corps). Edited by Kengo Tominaga. Tokyo: Akita Shoten.